February | 2011 | Climate Science: Roger Pielke Sr.
An unusual weather setup produced a very narrow and isolated band of snow across parts of Dodge City and Ford county on 1/19/11. The atmosphere was cold and moist with low clouds and fog preceding the formation of the snow. It appears that two slaughter plants and a power generating plant contributed to the snow as ice nuclei and copious amounts of water vapor were fed into the boundary layer. East/southeast winds carried the vapor and nuclei aloft into the lower clouds and then precipitated out as snow downwind of the source. Snowfall of as much as 0.7″ was reported in the snowfield with no snow observed at all outside of this area. and the article further summarizes his perspective. New Paper “Deep Ocean Warming Assessed From Altimeters, Gravity Recovery And Climate” By Song and Colberg (2011). There is a significant analysis quality issue with the authors using “the top of atmosphere (TOA) radiation measurements” as one of the constraints on their analysis. These radiation measurements are of fluxes and have a signficant uncertainty. Nonetheless, if we assume the analysis of Song et al 2011 is robust in that there is significant ocean heating below 700m (~1/3 of that between the surface and 700m if the steric sea level rise scales linearly in Joules), then this is a significant sink for this heat with respect to the rest of the climate system. The website Skeptical Science did not discuss this sink but, since heating at depth presumably is distributed spatially and becomes quite diffuse, its reentry into the higher ocean and atmosphere will be slow and muted, if it occurs at all in coming years and decades. The heating of the remainder of the climate system (included a “global annual average surface temperature trend) will be less than if this heat was confined to higher in the ocean (i.e. above the thermocline). 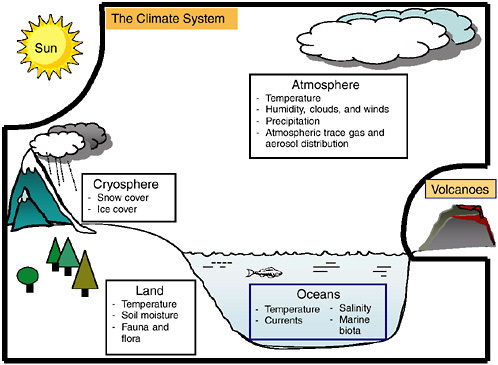 Any heat stored at depth in the oceans is a damping effect on the climate variability and longer-term change within the rest of the climate system. Comments Off on New Paper “Deep Ocean Warming Assessed From Altimeters, Gravity Recovery And Climate” By Song and Colberg (2011). This study utilized numerical model simulations to investigate the impact of land cover changes at lower elevations of Kilimanjaro on the regional climate of the area. RAMS was used to simulate atmospheric conditions for July 2007, assuming current, deforested, and forested land cover scenarios. The findings from the comparison of these simulations can be summarized as follows. 1. Comparison of RAMS simulations for current land use conditions against surface meteorological observations and satellite observations of cloudiness show satisfactory performance of RAMS over the study region. 2. The RAMS simulations show that deforestation at lower elevations of Kilimanjaro lead to a decrease in the frequency of cloud occurrence at all elevations. The cloud liquid water path decreases in response to deforestation except at higher elevations on the windward side where it increases. Reforestation has the opposite effect, increasing frequency of occurrence of clouds at all elevations, increases in cloud liquid water path except at higher elevation on the windward side where it decreases. 3. Precipitation decreases at low elevations and increases at midelevations on the windward side in response to deforestation. On the leeward side, precipitation decreases at midelevations, while there is a very small increase at lower elevations. The magnitude of differences increases with the extent of deforestation. 4. Flow diversion values computed for the different scenarios also show that obstruction caused by Kilimanjaro is enhanced when the lower elevations areas are reforested. 5. Surface moisture patterns are also altered because of changes in terrain flow, with reforestation increasing moisture transport to the lee side of the mountain compared to current vegetation and deforestation. 6. While differences in surface moisture contributes to decrease in frequency of occurrence in cloudiness, changes in flow pattern caused by reduced aerodynamic roughness play an important role. When the lower‐elevation regions are deforested, Kilimanjaro offer less obstruction to background flow, and the resulting increase in flow around the mountain causes reduced moisture transport to the lee side, causing reduced cloud liquid water path and precipitation. On the windward side, the increase in wind speed directed parallel to the topographic gradient at higher elevations, caused by reduced aerodynamic roughness in upwind areas, leads to enhanced surface convergence, cloud liquid water path, and precipitation. 7. Lack of precipitation at the peak during the period of study prevents making conclusions about potential impacts on precipitation at that level. Further study is required to investigate the possibility of such effects occurring during other seasons. This study addresses only the impact of deforestation on one dry season month. There are no compelling reasons for expecting the physical processes that cause the changes in clouds and precipitation to be substantially different if the analysis is extended to include the dry season month of July from other years. However, further study that extends the analysis to other seasons is required to establish the overall impact of land use change on the higher‐elevation climate of Kilimanjaro. This is yet another important study which documents the significant role of human alterations of the landscape on the climate. It is reproduced below from the February 18 2011 Boulder’s Daily Camera. Large dams — and the reservoirs they create — can increase rainfall in semiarid regions, according to a team of researchers that includes a scientist from the University of Colorado. The study, published in the journal Geophysical Research Letters, took into account both the size of the reservoir and the changes the reservoir may have caused in the way surrounding lands were used. “When you have a dam, the alteration of the landscape and the presence of the water body provide more water vapor to the atmosphere than would be there in the natural state,” said Roger Pielke Sr. of CU’s Cooperative Institute for Research in Environmental Sciences. Studies such as this one are important, Pielke said, because they highlight the ability of humans to inadvertently alter weather patterns and, therefore, modify the local impacts of larger climatic changes. These types of studies also show that there are many ways humans can affect the climate beyond emitting greenhouse gases, one of which is by altering the landscape. Faisal Hossain, a researcher at Tennessee Tech and a co-author of the study, agrees that the new research represents a change in mindset about how humans interact with the climate. Allard, J. and Carleton, A.M. (2010) Mesoscale Associations between Midwest Land Surface Properties and Convective Cloud Development in the Warm Season. Physical Geography, Vol. 31, 107-136.